The relationship between sugar and nausea is complex. In some cases, sugar can cause a reaction, making you feel nauseous. In other situations, you may feel nauseated and turn to sugar to settle your stomach and ease your discomfort. Additionally, the sugar in your blood can fluctuate too high or too low, also causing or rectifying feelings of nausea. And, of course, too many sugary snacks can make you nauseated as well. If your nausea is of concern to you, contact your doctor. If you lack the ability to digest the simple sugar found mainly in fruit called fructose, you may have hereditary fructose intolerance, according to the U.S. National Library of Medicine's Genetics Home Reference website. Symptoms develop in infancy when fruits are first introduced. In addition to nausea, symptoms include diarrhea, bloating, abdominal pain, low blood sugar and failure to thrive. If you continue to ingest fructose, it can lead to liver and kidney damage, eventually resulting in seizures, coma or death. Hereditary fructose intolerance affects about one in 20,000 to 30,000 people per year worldwide. If your nausea stems from infection, injury, dehydration, motion sickness or migraines, you may be able to calm your stomach and prevent vomiting by sipping small amounts of clear sugary liquids like flat soda, popsicles or apple juice. 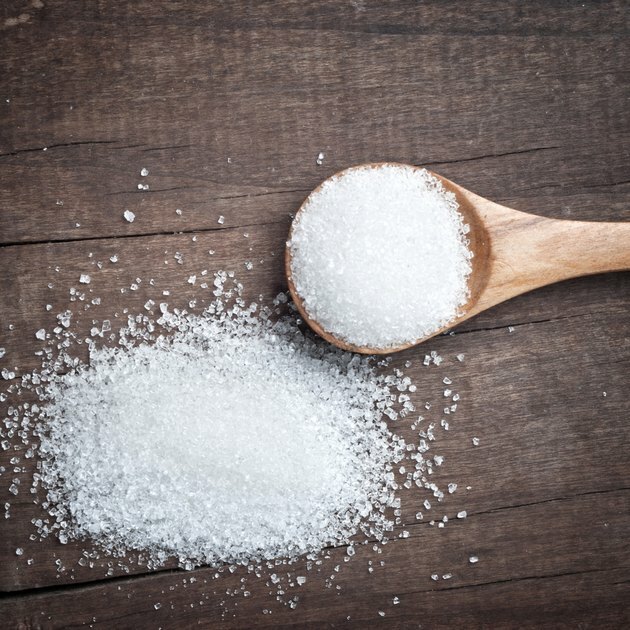 Cool liquids provide part of the soothing effect, but the sugar acts more efficiently than plain water alone at calming nausea, according to QuickCare.org. Hyperglycemia, or high blood sugar, affects diabetics with symptoms gradually developing over days or weeks. Early signs include increased need for urination, greater thirst, headache, fatigue and blurred vision. Left untreated, hyperglycemia progresses to include nausea and vomiting, breath that smells of fruit, weakness, confusion, dry mouth, abdominal pain and coma. If you are too sick to keep foods down or have a blood sugar reading of over 240mg/dL, seek immediate medical assistance. Low blood sugar, also known as hypoglycemia, affects many diabetics, but can also affect non-diabetics as well, causing nausea, fatigue, dizziness and headaches. According to Chief Medical Officer of the American Cancer Society Dr. Otis Brawley, non-diabetics can usually avoid bouts of hypoglycemia by frequently eating snacks with carbohydrates. Foods containing sugar can quickly increase blood sugar levels. Most often, low blood sugar is the result of an overly strict diabetic treatment which can be corrected by medication or diet. Nausea can result from overfilling your stomach with any type of food, but sugary sweets draw water into your digestive system, which makes your stomach feel upset, according to registered dietitian Joanne Larsen. Eating smaller portions of sugary foods usually solves the nausea problem. If not, discuss the situation with your physician.